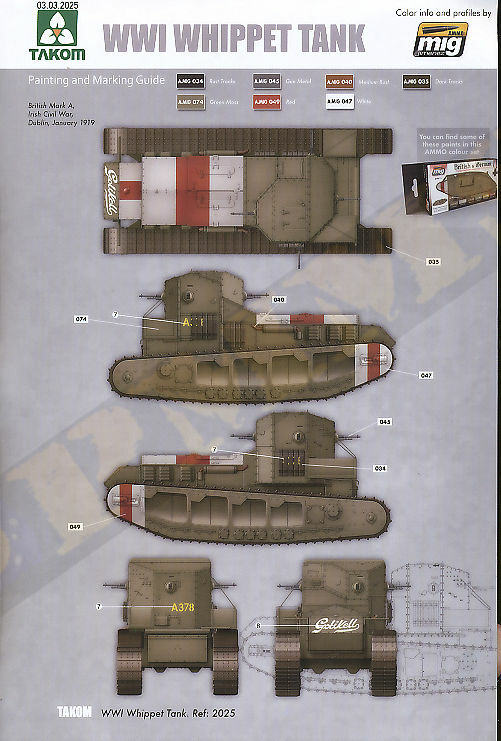 The Mk.A Whippet medium tank was a British tank of the First World War. 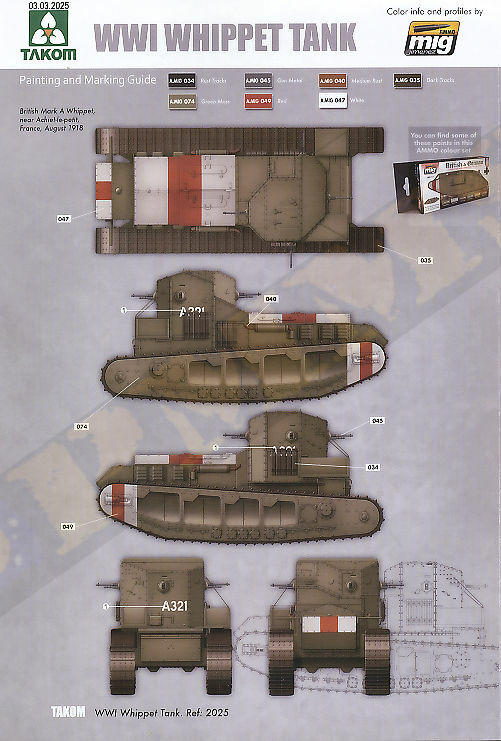 It was intended to complement the slower British heavy tanks by using its relative mobility and speed in exploiting any break in the enemy lines. 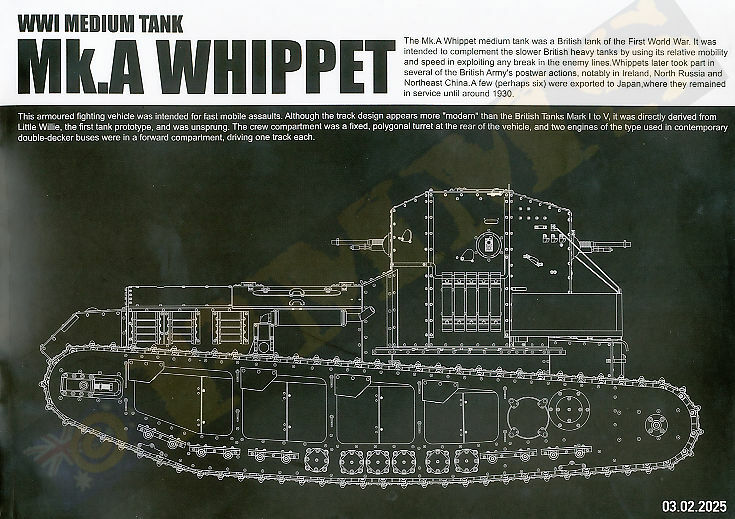 Whippets later took part in several of the British Army's post-war actions, notably in Ireland, North Russia and Northeast China. A few (perhaps six) were exported to Japan, where they remained in service until around 1930. This armoured fighting vehicle was intended for fast mobile assaults. Although the track design appears more "modern" than the British Tanks Mark I to V, it was directly derived from Little Willie, the first tank prototype, and was unsprung. 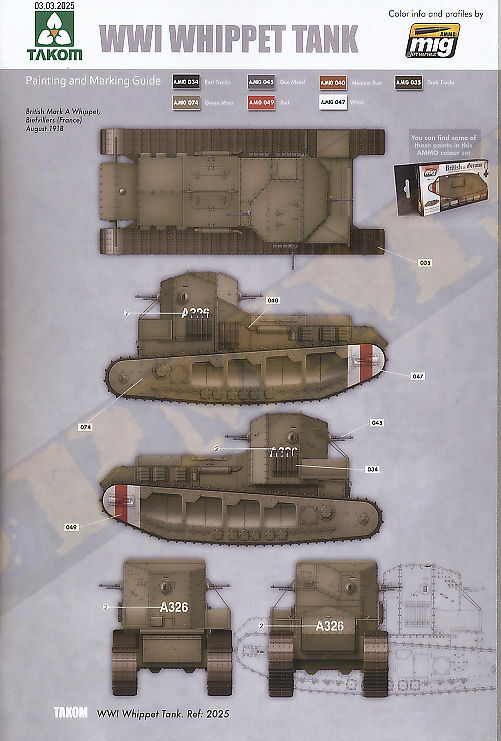 The crew compartment was a fixed, polygonal turret at the rear of the vehicle, and two engines of the type used in contemporary double-decker buses were in a forward compartment, driving one track each. 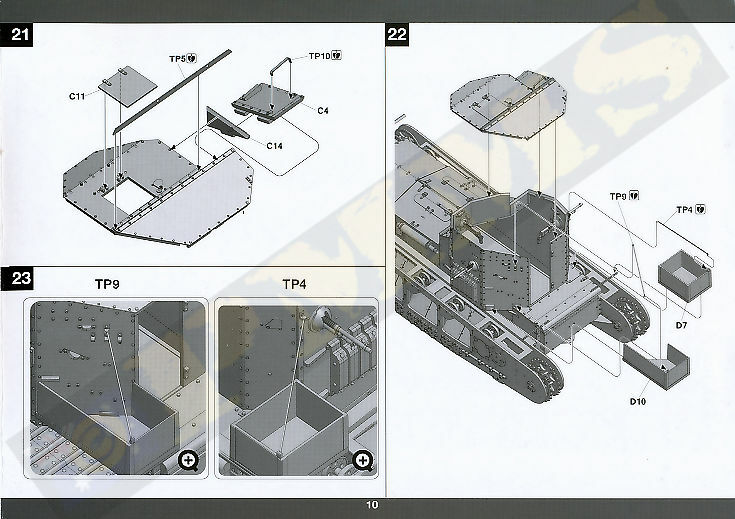 This new kit from Takom appears from available references to represent a later production Whippet, this being due to the raised visor guard around the driver’s vision slit; earlier types just had a simple slit for the driver. References are thin on the ground for the Whippet so please correct me if I am wrong here? 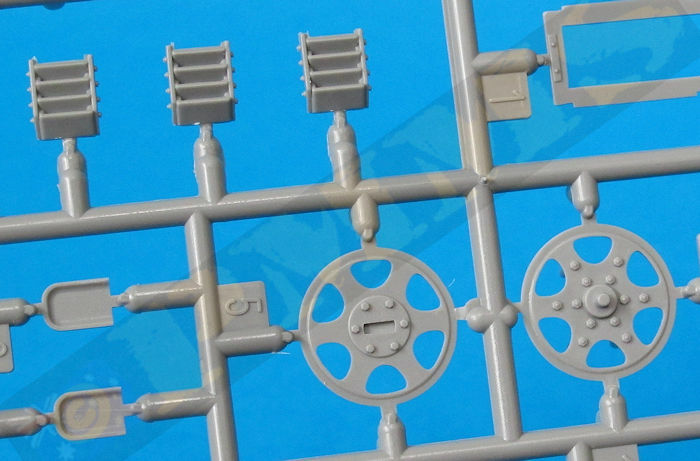 The kit is fairly basic with no interior other than the four Hotchkiss .303 machine guns but with full running gear/road wheels although none of this can be seen after you have added the outer hull panels and the tracks, there is also some nice PE to enhance the details provided. 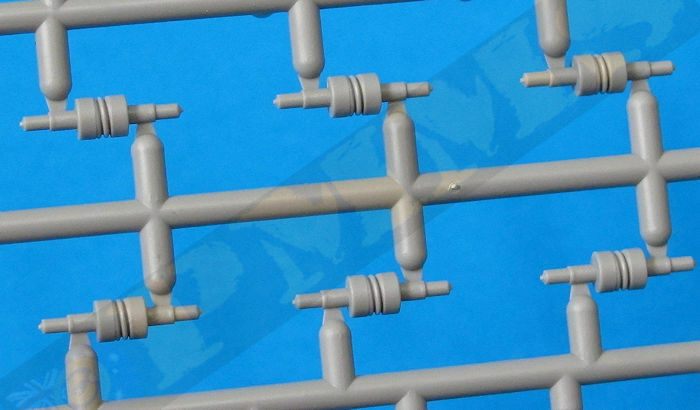 The quality of moulding is well done with cleanly represented bolt and rivet details and very few if any pin marks visible after assembly, there are though some quite substantial mould seam lines on many parts that will need some work and care in removing. 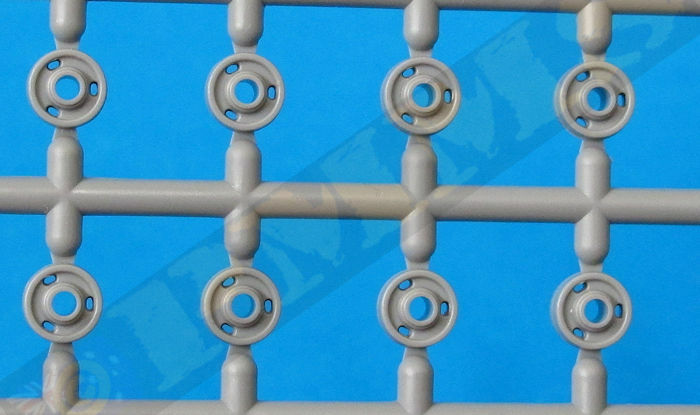 The plastic is of the slightly softer type which makes it easy to work with just be careful not to trim too much when cleaning up the sprue attachment burs. I don’t have any 1:35 plans for the Whippet but the overall dimensions match available references quite well using basic eye measurements give or take a mm here and there. 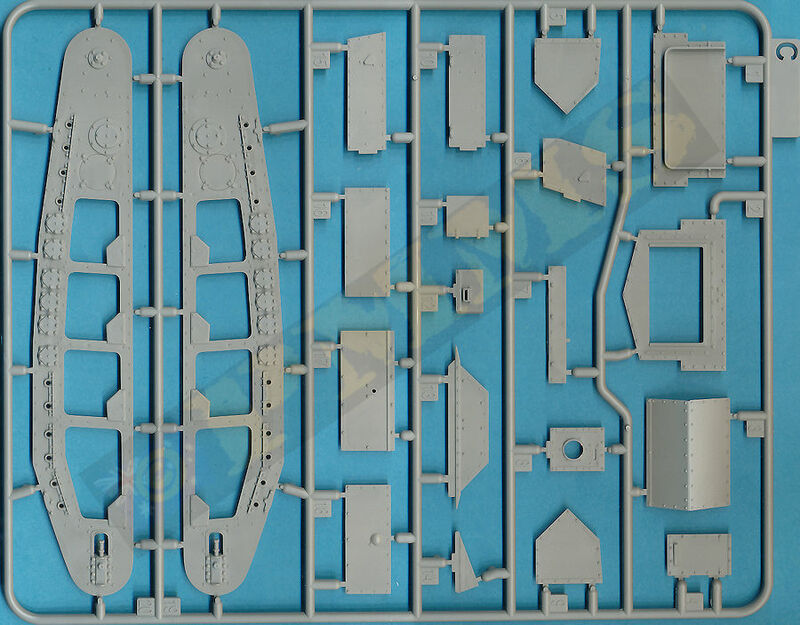 The outer hull sections and road wheels see the 16 pairs of road wheels, the drive and idler wheels plus the exhaust pipe and engine ventilation louvers all added to the inner side panel with separate inner bulkheads and mud panels added finishing off with the outer lower hull panel. There is quite a bit of work for the road wheel assembly but the rest go together quite easily. 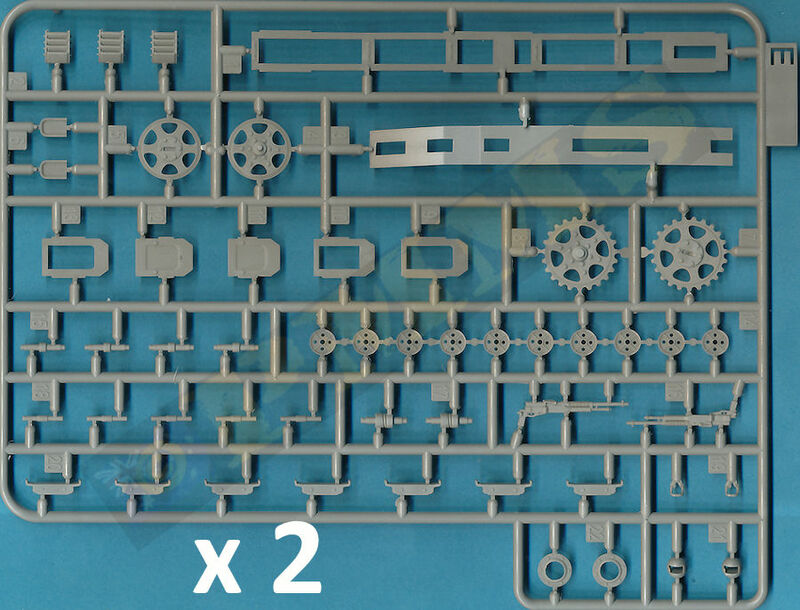 The road wheels and axles provided are the same as for the previously released Mk.IV kits and you actually get the Sprue A for those kits so there are some road wheels left over from the Whippet assembly so just assemble the numbered required for this kit and leave the rest. 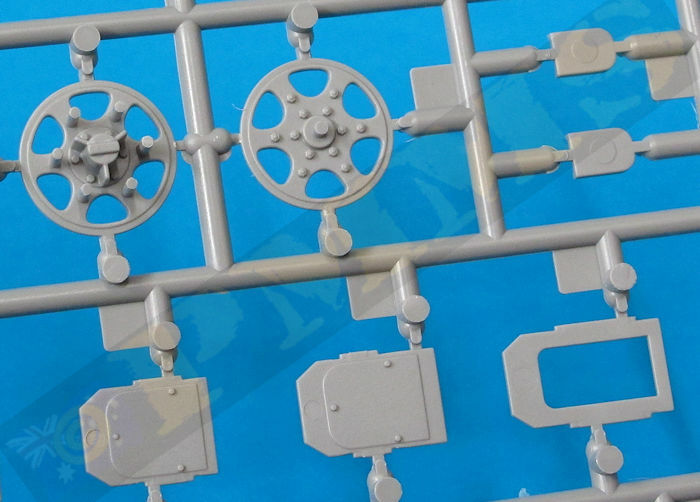 There are a lot of small wheels needed (74 in total) and removing these from the sprues and cleaning up the sprue bur is a little tedious, I didn’t clean up the mould lines on the smaller road wheels either to save time as these can’t be seen anyway after assembly. 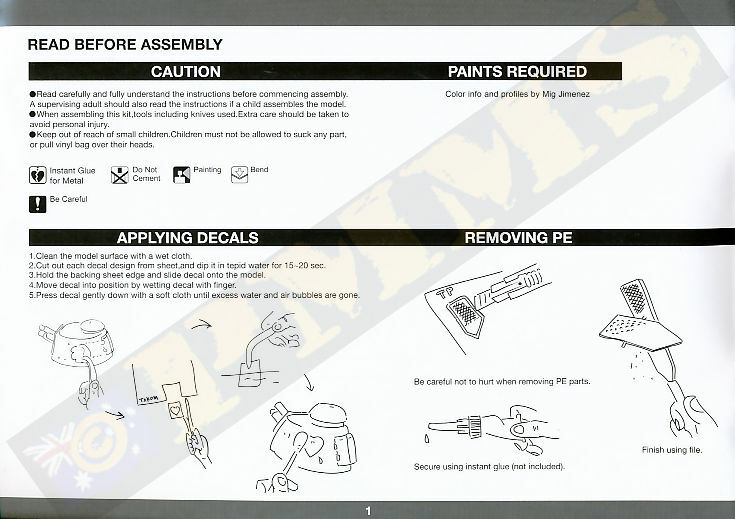 Firstly glue all the required road wheel pairs together taking special note of the four different types as indicated in the instructions and set aside to dry before fitting to the hull side panels, the drive sprockets and idlers can also be assembled ready for fitting. 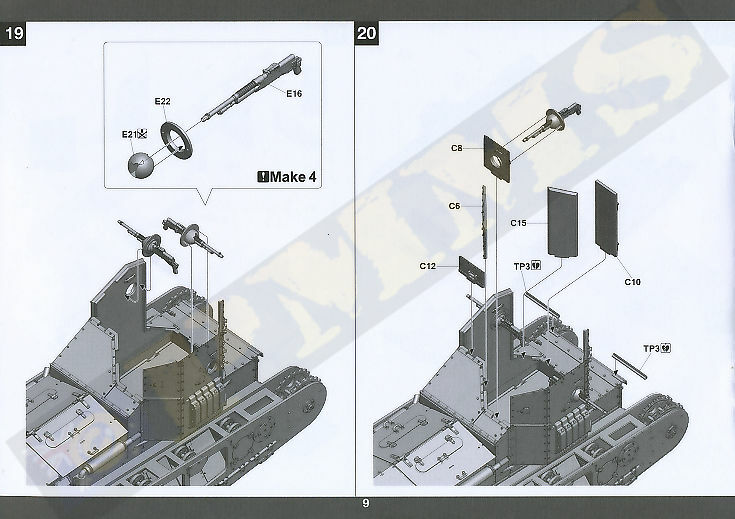 Before fitting the road wheels to the inner hull panel you will need the shorten the axle stubs on the middle six road wheels that have the outer axle bearing plates (C, D) to allow the hull panels to fit correctly, the idler axles will also need to be shortened a little also. 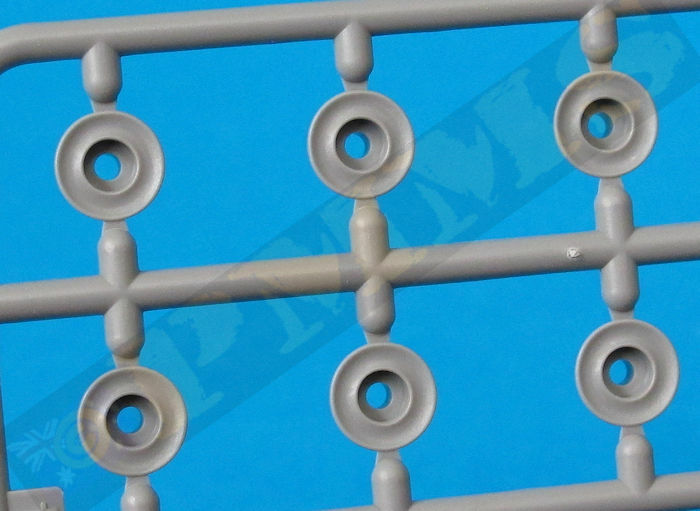 To get the road wheels to fit together some of the smaller wheels will need small sections cut away to allow these mesh with the larger wheels properly, this is due to the outer lip on the larger wheels being oversized so the wheels that fit closely together have a problem as they come. See the image below, I may have cut away too much from the wheels but I didn’t want to have to come back and trim some more later and as you can’t see this after assembly anyway it doesn’t matter if you cut away too much of the wheels. It is also best to glue the axle subs to the hill side panel as getting all those wheel to just sit in position while you fit the other panels is all but impossible. 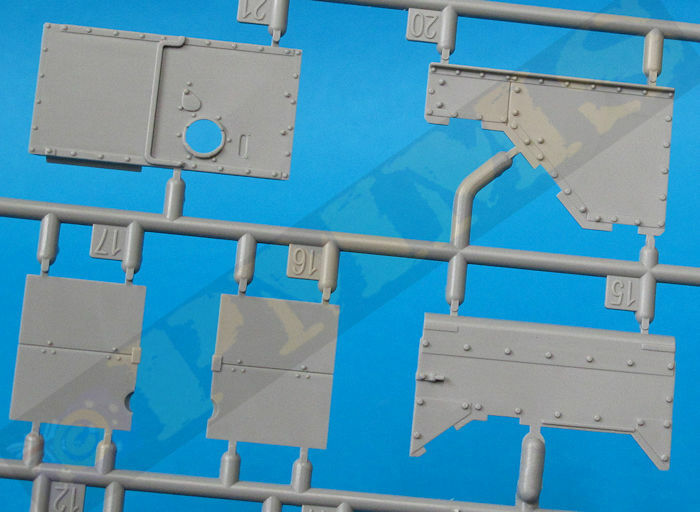 With the road wheels glued in place the additional bulkheads, mud slide and top and bottom panels can be added, the fit is good here but make sure these are pressed firmly in place as the glue dries for the best fit of the outer hull panel. 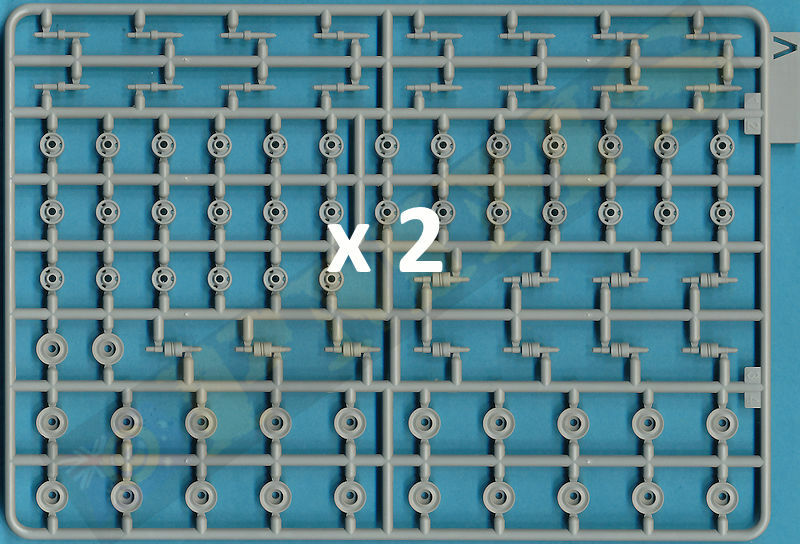 The five top return rollers can also be glued into position making sure they sit at right angles to the hull, the same goes for the lower road wheels as well. With all the wheels and panels in place the outer hull panels can be fitted and it’s a little fiddly to get all the axles and panels aligned as you glue and it’s easiest to start gluing from one end working your way along the hull getting the axles seated as you go. With all glued you must ensure the hull panels fit as tight as possible and I used clamps to keep things tight, especially the centre section with the axle bearings where the axles don’t protrude though the hull as with the other road wheel axles. Note at this stage I left the idlers and drive sprocket off as these can be fitted after the outer hull assembly ensuring they are free to rotate after assembly, also there are 20 small etched hooks added to the outer hull panels and it’s best to leave these to very last or they will get broken off while handing the model during assembly. 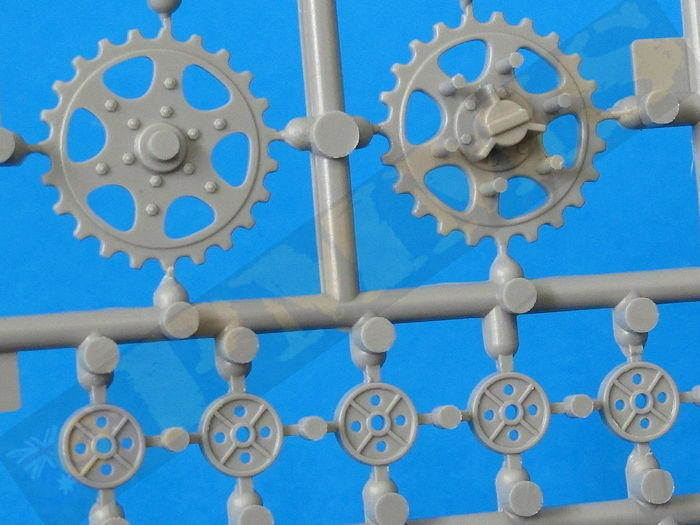 To fit the drive sprockets is easy, just spread apart the two outer hull panels slightly and slip the sprocket axles into the locating holes, there is enough movement of the hull panels to do this without any problems after the hull assembly and makes life easier while lining up all those road wheels during the assembly. 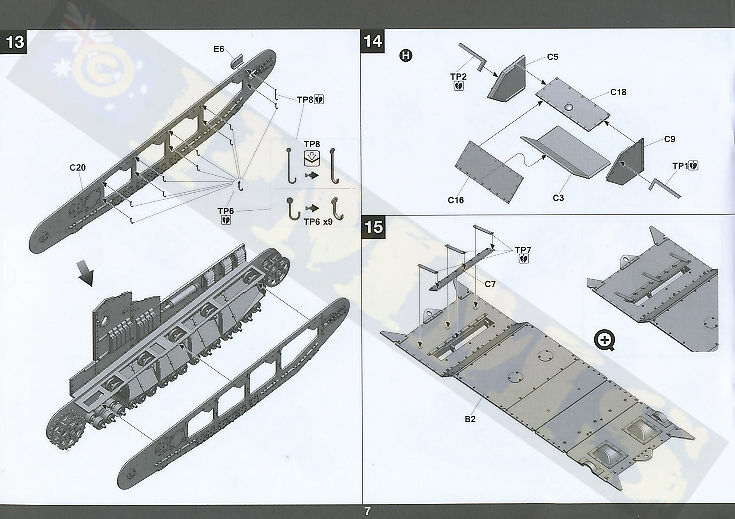 The front idlers have three alternate positions and you choose your preferred position and fit the idler the same way as the sprockets by slightly spreading the hull panels apart and fitting the idler in position to allow rotation after assembly. 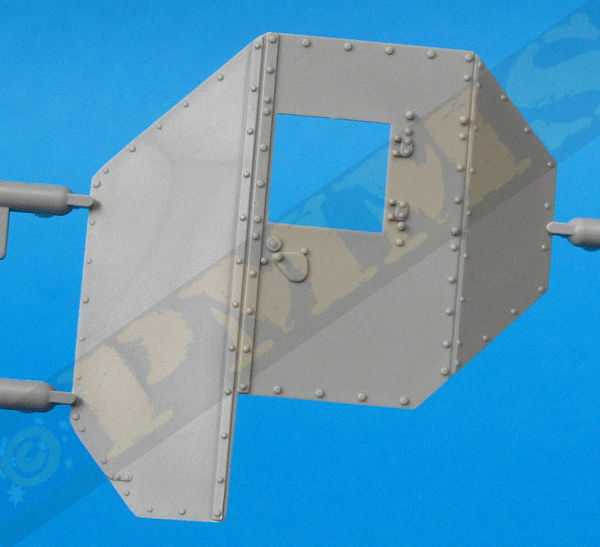 The large lower hull plate has nice rivet details and a separate intake louver with etched braces underneath and the front mounted fuel tank is made up of five panels that again have nice rivet details included. 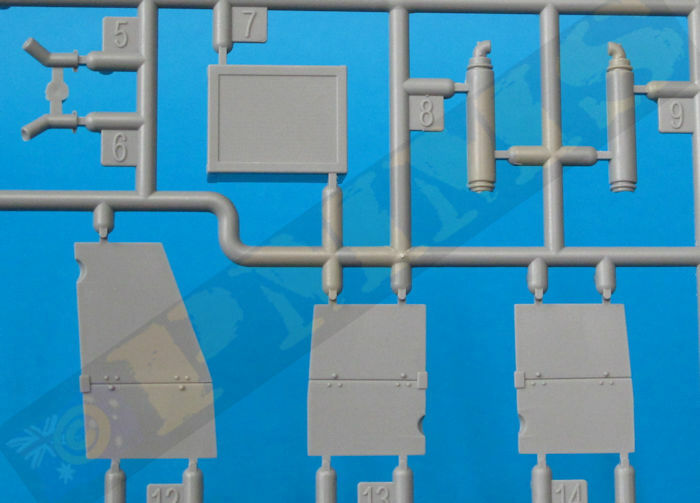 The tank assembled easily just make sure the joins are as snug as possible, also note the panel joins have small indents that look like gaps where the panels overlap and this is correct due to the way the panels were bolted together on many WWI British vehicles. The two large front fender supports are provided in etched brass (TP1, TP2) and need to be bent to shape which is easy enough using a good quality etched bending tool ( I used the RP Tools bending tool as this works very well for smaller/finer bending jobs). With the L channel shape bent you then bend the inner section at right angles and you really should solder this join otherwise it can easily snap off as the supports just hand out there asking to be hit and just a couple of bends will see the join break as is the want of thin metal parts. After soldering the join the brackets are then glued to the fuel tank using cyanoacrylate with the tank added to the front hull plate. Before fitting the lower hull plate and outer hull sections together I glued the front plate (C2) and rear plate (C1) to the lower hull ensuring these are at perfect right angles and let the glue dry before fitting the outer hulls, this gave one less thing you have to worry about lining up as you glue the assemblies together and also made the assembly job easier. 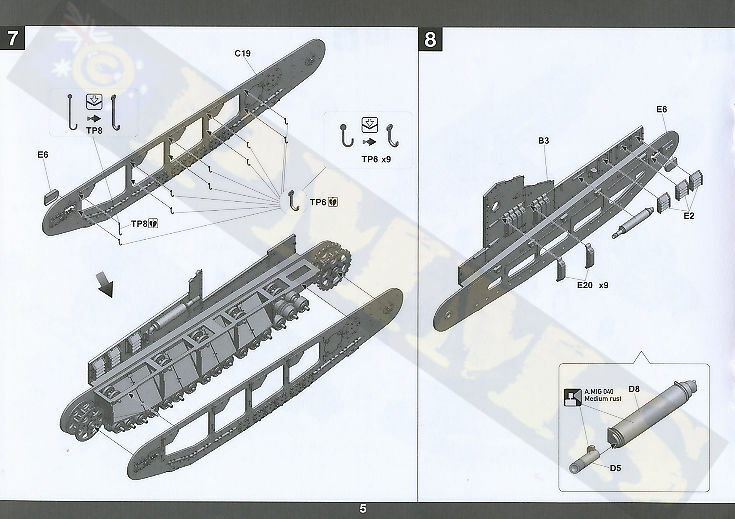 The port side section of the upper hull that protrudes out over the tracks was also assembled as a separate sub-assembly in step 18 and set aside to dry for the same reason, to make it a lot easier when fitting to the main hull. The fit of these panels was good but again you need to make sure all are firmly aligned to avoid problems later. 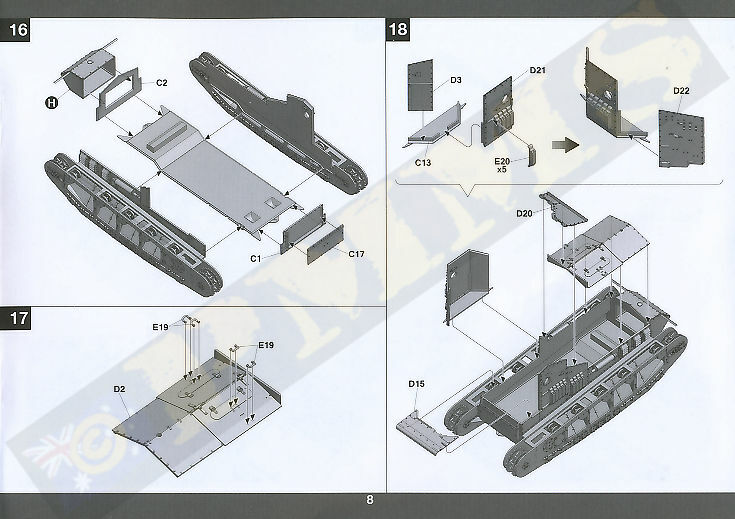 There are additional track spuds fitted to the outer panel here also and I strayed from the assembly sequences by assembling and fitting the four Hotchkiss MGs while the panels were separate as this made it easier to fit. 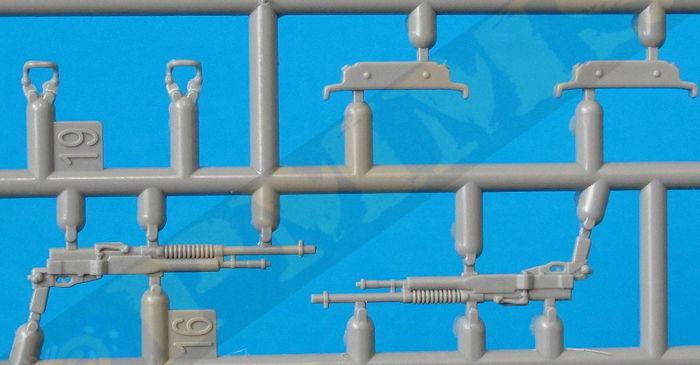 The MGs themselves are moulded in one piece and have nice details but the gun details appear a little heavy though nicely rendered and there are also substantial mould lines to be removed in particular on the fine cooling ribs and will need some care to remove these lines. 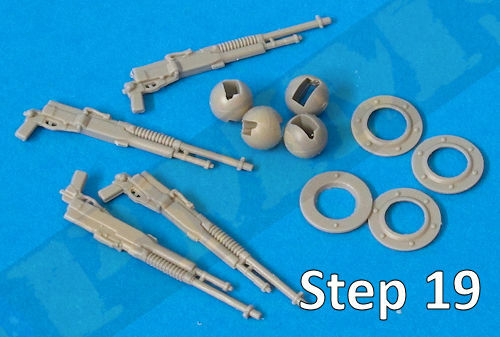 The separate ball mounting have a bit of flash around the openings that is easy to remove and you will need the sand down the mould lines to allow for free movement on the ball within the mounting after gluing together. The guns fit neatly into the recess inside the ball mounting (E21) and glued firmly in place, the MG/ball mount is then held in place by the inner securing ring (E22) and you should make sure to use glue sparingly when fitting the ring to not get glue on the ball in the process. To help in fitting the ring I marked the location of the two inner pins on the outside of the ring with a felt pen to aid in aligning the pins to the location holes when fitting to the hull plates. 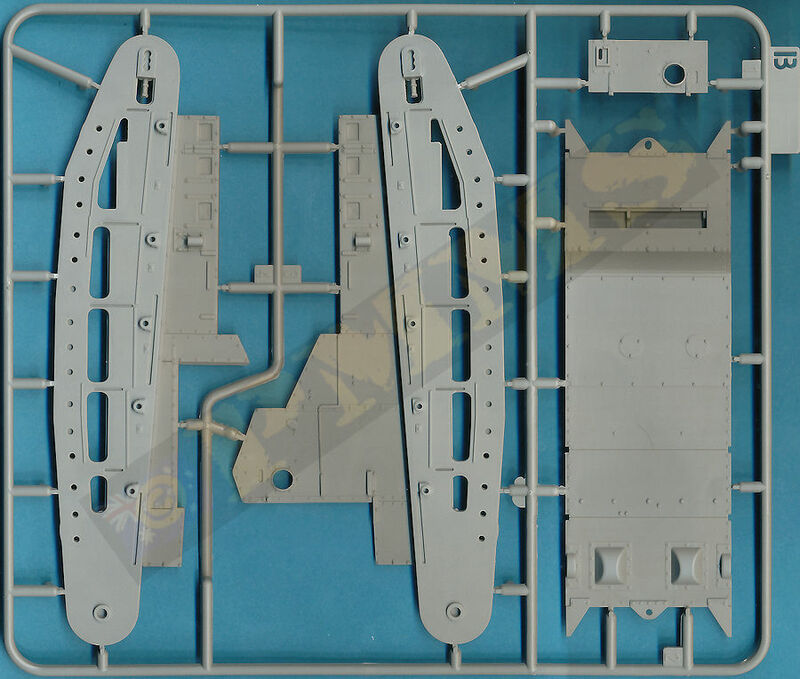 The hull top sections have nice rivet and hatch details and are easy to fit but is best to fit in sequence to ensure each is firmly bedded as you go, I attached the rear deck (D15) followed in order by the engine compartment cover (D2), lower fighting compartment panel (D20) and then the outer hull sub-assembly from step 18. With these glued in place the remaining upper panels can be added and again make sure each in turn is properly aligned and seated firmly in place as you go, it’s good to fit all the remaining panels at the same time to allow for minor adjustments as you fit the next panel. The three front panels (C12, C6 and C8) fit snugly in place along with the two longer rear panels (C15, C10) and as there is no interior the separate rear door (B1) is best glued in the closed position, note this panel in incorrectly numbered in the instructions as B7 but is in fact B1. 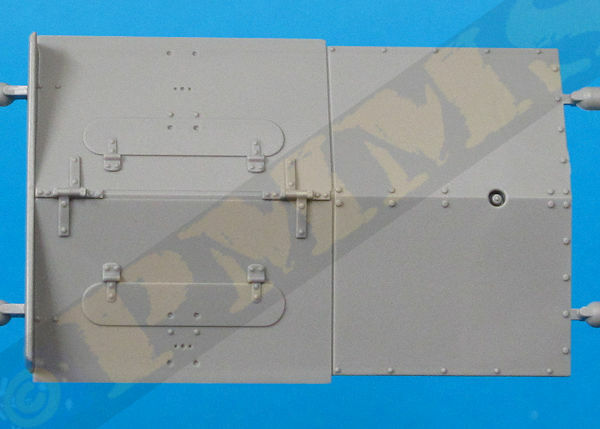 The roof (D1) has additional details added prior to fitting to the hull with the two right side panels and separate Commander’s hatch, the latch moulded on the inside of this hatch will need the tip of the latch trimmed off to allow the hatch to fit properly into the roof opening. 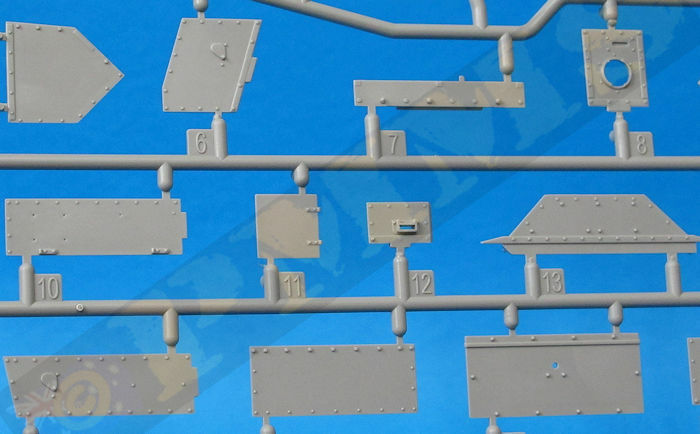 There is an etched strip added to the top and this should be set at right angles to the top section of the roof with the hatch, this can be a little confusing with the roof separate from the hull. The fit of the roof to the outer other hull panels was good overall but I did need the squeeze some to fit snugly and some minor trimming was needed on the outer right front corner, this was reducing the inside thickness of the roof moulding so it sat lever in the recesses inside the top of the side panels but test fitting will determine if any trimming is needed and you should test fit all the panels before gluing just to make sure all is aligning properly. With the main assembly done you can then add the numerous small etched hooks to the lower hull sides, trimming the fret attachment bur from these small parts will take some care and I found it easier to hold the hooks tightly in tweezers and use a sharp #11 blade to trim the bur instead of filing as the hooks are too small for this safely. The hooks have a small round “head” that you need to twist around at right angles to the hook which is easily done again using good tweezers to hold and twist the heads, the hooks are then glued using thinker cyanoacrylate to the locating points on the hull sides. 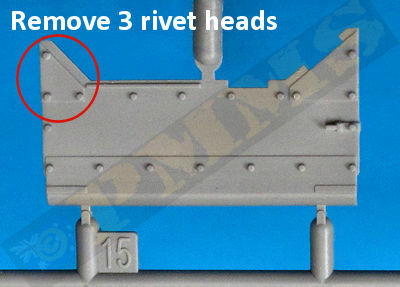 Be careful handing the model once these hooks are in place as they tend to break or bend very easily. 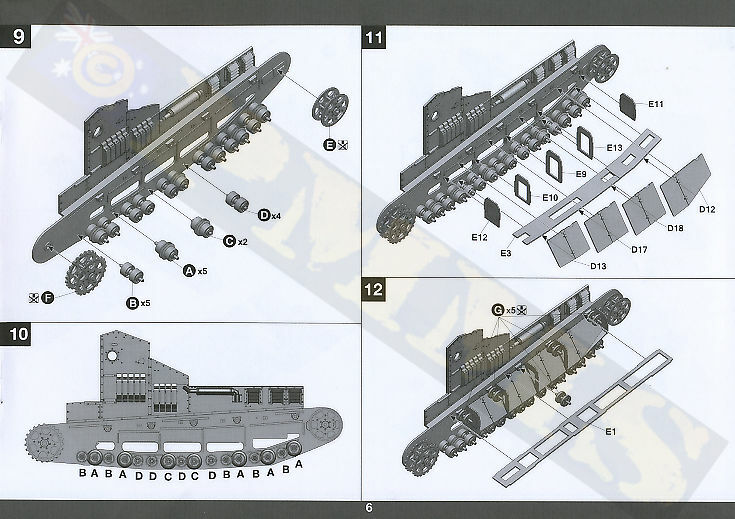 The tracks with this kit are the same single piece snap together links as included on the previous Mk.IV Hermophrodite (kit #2010) with each link having the inner brackets and outer track pad rivets included on a single link. 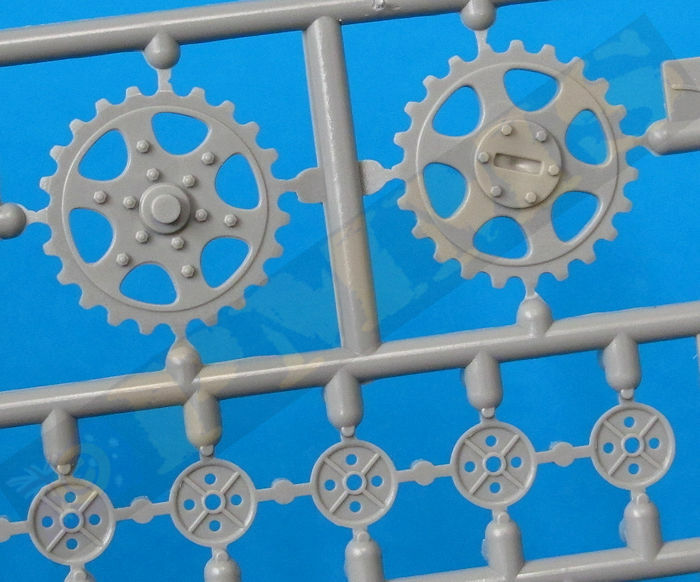 Detail on the links is adequate although the outer bracket detail is a little subdued but this is mostly hidden after the tracks are fitted so not a big deal. 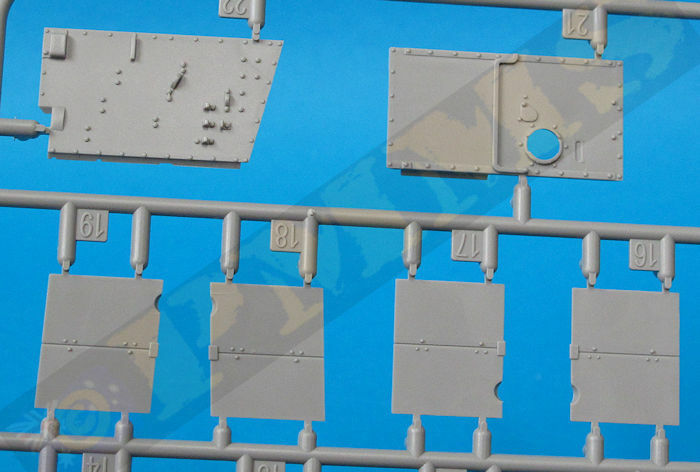 There is also some minor flash on some links and small embossed part numbers on the inside of the links but again none of this is visible with the tracks fitted so don’t spend time removing these beforehand unless you are depicting a damages tank with the tracks of where the insides of the links will be visible? On the outer link there is a single pour point on the curved part of the track and this will need care removing to not alter the profiler of the link in the process. 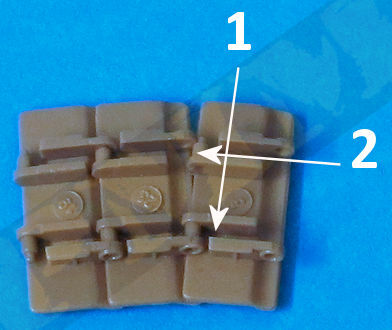 Assembly of the links is very straightforward with the pin of one link slipped in to the hole of the next and then gently press the link outwards (or downwards towards yourself) while clipping the other pin into place, repeating this for each link for the full track run. The instructions say to use 69 links per track run but this depends on the position of the idler wheel, I had the idler on the rearmost position and this only required 67 links per track run so test fit your tracks before final fitting to make sure they sit snugly around the suspension. Clipping the ends of the track runs around the suspension is easy enough as the tracks are quite robust and allow some twisting without coming apart, they are also easy to ‘unclip’ if you need to add or remove a link for the best fit. 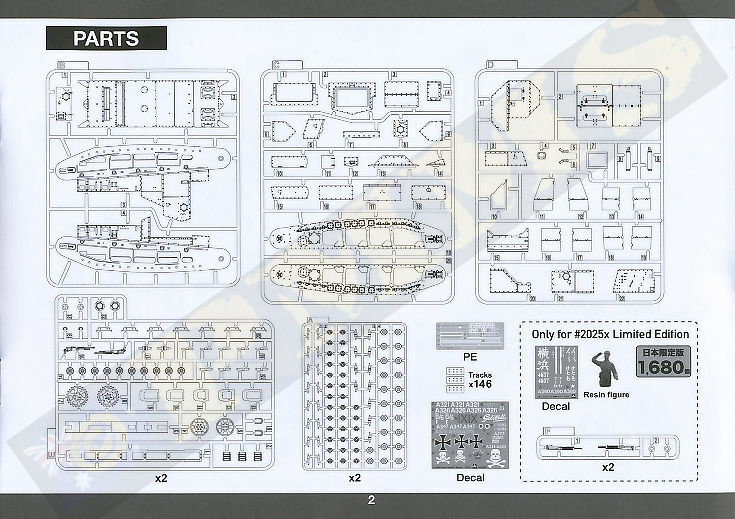 The instructions are the usual exploded view drawings and as there isn’t a lot of parts quite easy to follow but you do need to study the sequences before gluing and test fit parts such as the hull panels as with any kit to avoid any problems. 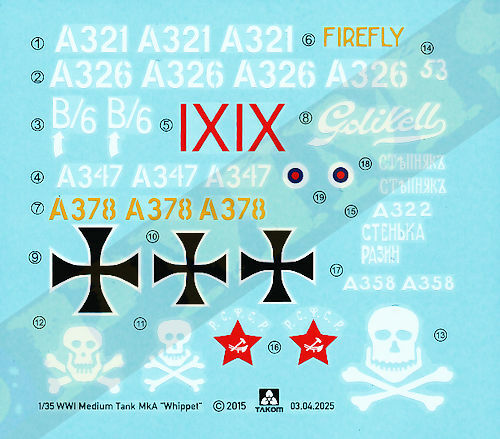 The decals are nicely printed with good colour register and provide markings for eight Whippets, the separate all colour foldout marking sheet gives info on the markings as well as ‘mig’ paint numbers plus the colour names should you use other brand paints? 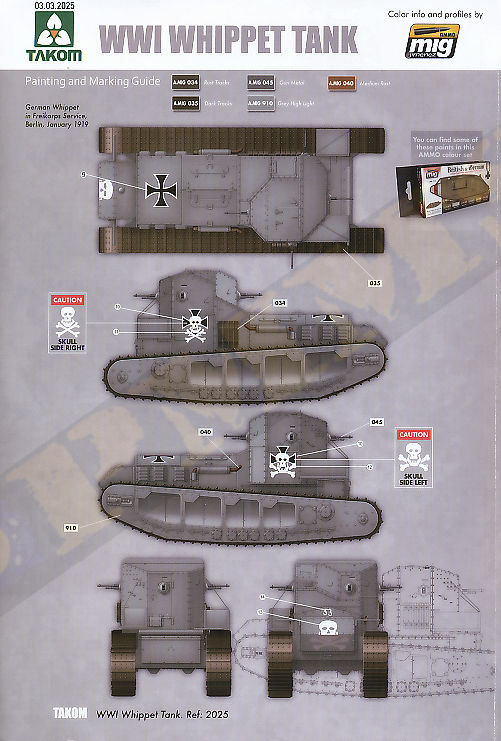 The eight schemes give a good selection of WWI British, captured German and Post War Whippets with some nice variations in paint schemes and markings. 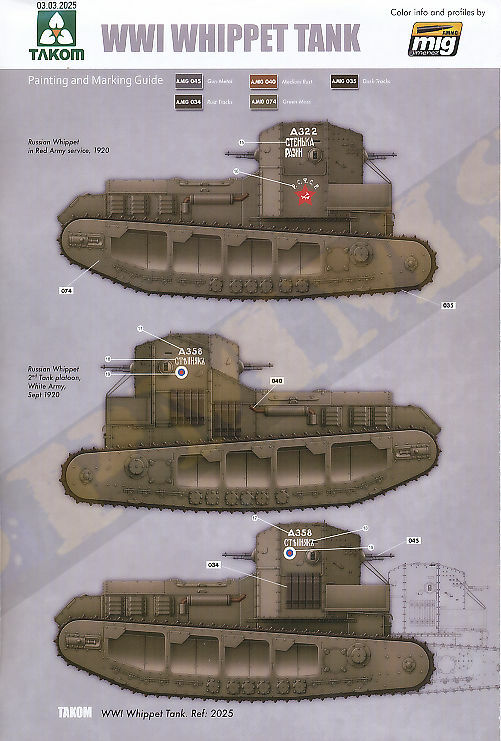 British Mk.A Whippett 347 of 6th Battalion Tank Corps.B Co. 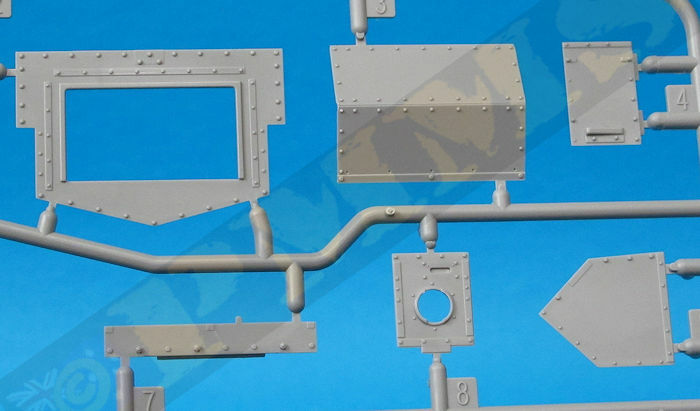 Overall this is a fairly simple kit of the Mk.A Whippet with not a lot of parts and good detail rendering of the rivet and panels details and includes all the main features of the Whippet production tank of WWI. Assembly is fairly straightforward apart from the many road wheels but with patience there shouldn’t be any major problems. 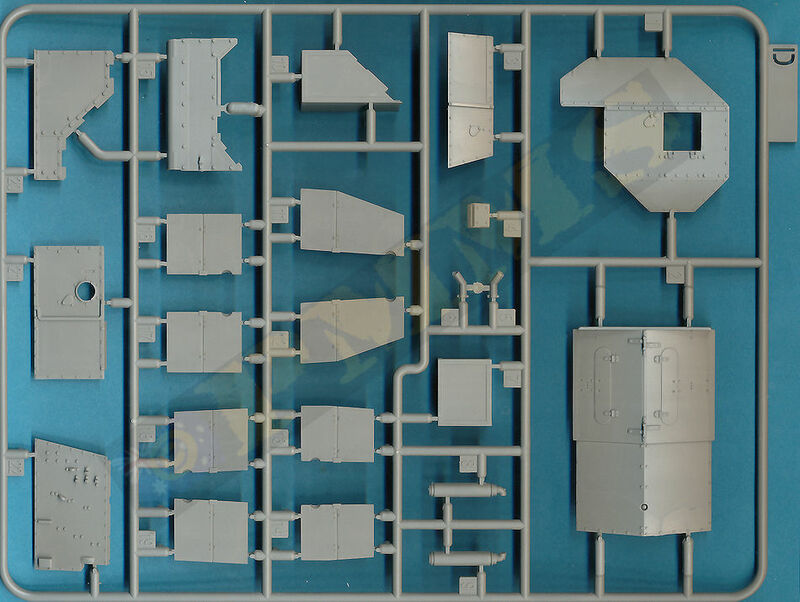 The fit of the many individual hull panels was good overall but there is scope for problems if you don’t test fit and make sure each aligns as best it can before proceeding and as with any kit there is scope for adding additional details should you wish. 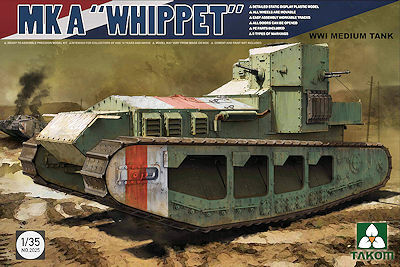 The finished model builds into a nice representation of the Whippet and is a vast improvement over the one and only Whippet available in 1:35 prior to this release. various images on the Net. Thanks to my traumatised bank account and for the review kit.